Most companies utilize multiple data-collection tools, including those that collect data from online sources (e.g. web analytics and marketing-automation platforms) and from offline sources (e.g. transaction systems). The fact that large amounts of data are collected from a variety of sources makes the gathering of all these data sets together in one place very important for any company wanting to learn more about how their customers behave across channels and devices, and to reach new potential customers. Collecting all this data from different sources and organizing it into structured, useful pieces of information isn’t easy, however, unless you use a data-management platform (DMP). One of the exciting aspects of a DMP is its ability to create valuable audience segments and use them for a range of online and offline marketing and advertising activities, but none of that would be possible without properly collecting the data first. While the data collection and normalization step happens right at the beginning, it plays an important role in the eventual outcome of the subsequent stages — segmentation and data activation. Web and app data: Collected about your customers who visit your website and/or app. Data from your first-party systems: This includes valuable, but highly sensitive, customer data (name, address, email address, etc.) from your online and offline systems — e.g. customer-relationship management (CRM) and transactional systems. Data from your marketing and advertising campaigns: For example, data from search-engine marketing and display-advertising campaigns. Data from second- and third-party sources: Data from partner sites and from third-party data providers, for instance. However, you can find on the market other powerful software that helps you collect data. It’s called a customer data platform and it lets you gather and then stitch host of data broken up across multiple channels. A CDP enables you to garner web, mobile and behavioral data, but also data from transactional systems, CRMs plus off- and online sources. 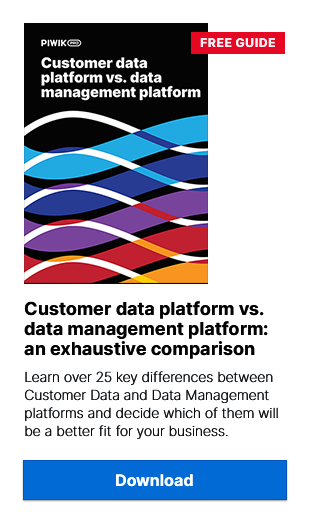 If you want to get more information about the platform and its capabilities check out our post: Customer Data Platform: What is it and How Does It Work? A DMP can collect data via tags. A DMP can collect data via a server to DMP integration. A DMP can collect data from various systems (e.g. transactional systems and marketing automation platforms) via an application programming interface (API). If a large publisher (e.g. cnn.com) wants to send its website data to its DMP, it could use tags. Alternatively, an e-commerce store could send customer data from its marketing-automation platform to its DMP via an API. There are also other ways to collect and import data, with first-party data onboarding being a prime example. In addition to gathering first-party data, many DMPs will enrich the company’s data with location and third-party audience data provided by data suppliers. This third-party audience data can be used for behavioral analysis and lookalike modeling, which involves finding audiences that share similar qualities and behavior to a company’s target and most profitable audience. Once the data has been collected, it’s time to normalize it. Gathering IDs from web cookies. Deleting redundant or useless data. Transferring the source’s data schema to the DMP’s data schema. Enriching the data with additional data points, such as geolocation and OS/browser attributes. It organizes the various data sets into a common format. It improves data value and quality. During the normalization and enrichment stage, each user will be assigned a unique ID and given different attributes, which will play a key role in the segmentation stage. Profile building is an essential part of the whole DMP data-collection process, as it is responsible for transforming the collected data into events and profiles, which are the cornerstones of audience segmentation. Another important part of the profile-building stage is the matching of data sets using common identifiers — e.g. matching an email address from a CRM system with an email address from a marketing-automation platform. This ensures all correlated events and attributes are merged into one profile, therefore eliminating duplicate profiles. Above is an example of how a DMP would merge existing profiles together to avoid duplication. Many argue that data activation is the most important part of your data strategy, and while this is somewhat true, the truth is that if your audience segments contain duplicated users and shallow profiles (e.g. profiles with only a couple attributes), then you won’t get the results you want. Please note: The actual data collection, normalization, and enrichment process will vary slightly among DMPs.